In retrospect, Tassie Collins says, it makes total sense for U.S. Customs officials at Los Angeles International Airport to halt shipment of a suspicious white powder. But when you're a scientist at a nonprofit foundation, focused on moving a potentially groundbreaking multiple sclerosis drug from theory to actual testing in humans, some of the more-mundane details of international shipments can slip by. The delay, however, hasn't stopped the Myelin Repair Foundation, where Collins is vice president of translational medicine. The Saratoga-based nonprofit announced Thursday that the National Institutes of Health will enroll patients in a first-of-its-kind, early-stage clinical trial of the experimental MS drug, called guanabenz. The study, a collaboration between the MRF and the NIH's National Institute of Neurological Disorders and Stroke, will look at the one-time high blood pressure treatment in MS. But it also could lay the foundation for similarly targeted therapies that could stop — and possibly repair — the debilitating damage to the brain and spinal cord caused by multiple sclerosis. If guanabenz proves itself in clinical trials, it could become a low-cost treatment for MS patients, potentially in combination with drugs that modulate the immune system. If it doesn't do well in the clinic, its legacy could be a newly constructed framework for studying a new generation of MS drugs focusing on capping myelin damage. "Our hope is that guanabenz will be effective in Phase II studies, and that this will stimulate investment from pharma in further development of this drug as well as investment in other neuroprotective treatments for MS," Collins said. MS is a progressively debilitating disease in which the immune system runs amok and attacks the protective myelin sheaths around nerve cells. Symptoms — which include fatigue, numbness, uncontrollable muscle twitches, dizziness and vision problems — can disappear for days or years before flare-ups occur in the roughly 400,000 Americans with the disease. Today's treatments largely focus on suppressing the immune system to manage those flare-ups or extending the time between episodes. But the Myelin Repair Foundation, founded 11 years ago by MS patient and current foundation President and CEO Scott Johnson, has used collaborations with academic scientists and companies to discover ways to protect and possibly regrow myelin. it also has been financing its own research at labs in Sunnyvale. "We're trying to build a portfolio of compounds to move into clinical trials," said Jay Tung, the foundation's chief research officer. But the MRF opened new problems when it came to guanabenz. After all, the drug hadn't even been made for seven years — and that was as a low-cost generic treatment for high blood pressure. It had taken an MRF team, including a consultant, several months to track down a manufacturer in Spain just to produce 20 kilos of clinical-grade material for testing. But when that shipment came into LAX, customs officials were suspicious. While bringing guanabenz to that point, the main question on the minds of MRF leaders and advisors was whether the nonprofit could eventually find a drug that would pencil out economically for for-profit drug developers. They were floored by the logistical issues. It took a year for the MRF, working with the NIH and the Food and Drug Administration, to sort out the issues around shipping guanabenz into the United States. It had to send the entire shipment back to the Spanish manufacturer, file an investigational new drug application with the FDA and get permission to import several smaller batches of the drug. Less than a kilo is needed for Phase I and Phase II trials in what normally is a three-step FDA drug approval process. It was the MRF's deep relationships with academic research that pushed guanabenz to the starting line of human clinical trials in the first place. The foundation for more than 10 years, for example, has helped finance work by the University of Chicago's Dr. Brian Popko. Since the early 1990s, Popko has studied how a certain cellular subunit, called the endoplasmic reticulum, responds to stress in myelin-creating oligodendrocyte cells. About five years ago, Popko read a paper in the journal Science about managing the so-called ER response with guanabenz. It was kismet. Popko's lab had worked with genetic models of how to control the ER response, but now it could test an actual drug in mice. Popko's lab ordered small amounts of the drug — enough to use in mice but not in people — from a chemical supplier. The lab ultimately found that guanabenz could play an important role in the survival of oligodendrocytes in the presence of inflammation. He presented the data to Collins and Tung at the MRF and was interested in designing an experiment in mice to see if the drug could actually protect those myelin-producing cells. "There are all kind of drugs but one of the issues that the pharmaceutical industry faces is off-target effects, side effects," Popko said. "The reason we spent so much time on this pathway is because enhancing the stress response is therapeutically appropriate. It prolongs a naturally occurring response of the cell to stress. "It doesn't activate any new pathways or shut anything off," he said. "All it does is enhance a pathway that is already activated." Essentially, guanabenz's benefit may not be so much about producing new myelin in damaged cells as it is about making brain cells more robust in the face of stress. 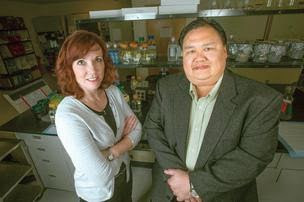 The MRF connected Popko's lab with another at Case Western Reserve University in Cleveland — also in the MRF research consortium — that was expert in finely slicing and getting data from rodent brains. In the end, the researchers got strong signals. "We had animal data and culture data with the same result," Collins said. "We said, 'OK, this sounds like something.'" Encouraged by Dr. Alfred Sandrock, the chief medical officer at biotech giant Biogen (NASDAQ: BIIB) and a member of the MRF's clinical advisory board, the foundation moved toward a clinical trial of guanabenz in humans. The foundation wasn't designed to run a human study, the costs of which can climb into the tens and hundreds of millions of dollars. But Sandrock pushed MRF CEO Johnson to keep moving forward. MRF officials knew the drug, called MRF-008 in their early work, was generic and off-patent, making it cheaper to obtain. In fact, pharmacy databases listed it as available for $20 a month. "You guys can do this," Sandrock said. What they didn't know, however, is that guanabenz hadn't been regularly made for at least seven years. What's more, the drug had a five-year shelf life, so any batches on the market weren't likely to be good. The situation ultimately led the MRF to find the manufacturer in Spain, but caused a six- to eight-month delay. The holdup with Customs added another year. Meanwhile, Henry McFarland, chairman of MRF's clinical advisory board and the retired chief of the neuroimmunology branch of the National Institute of Neurological Disorders and Stroke, recommended MRF talk to Dr. Danny Reich, chief of the neuroradiology unit of the neuroimmunology branch of the institute, about designing a new kind of clinical trial. "They said, 'Here's this drug and this is the way we think it works. How would you test it?'" said Reich, who is overseeing the initial six-person guanabenz trial with the NIH's Dr. Irene Cortese. The issue was that there was not an approach for testing drugs like guanabenz. NIH work in the 1990s helped determine efficient ways to test the immune system via frequent MRI scans that pick up the formation of new plaques, rather than counting the number of MS relapses. But there was no accepted way to look at myelin protection. Reich's group opted to use MRIs as well, looking not at whether plaques appear but how they appear. The MRI, measuring the same plaques every month over six months, "doesn't tell us what kind of damage that is. It doesn't tell us whether it's myelin that's lost or axons lost or if scarring is forming," Reich said. "But we think we can say for a medicine like this: If it doesn't work in this trial design, it's probably not going to work at all."